In this video, we describe the technical nuances of an endoscopic endonasal approach (EEA) for a complex macroadenoma with suprasellar and retrochiasmatic extension. The patient is a 51-year-old male with several years' history of progressive visual loss. Neuro-ophthalmology assessment revealed a profound visual loss with homonymous hemianopsia and left optic nerve atrophy. His pituitary hormonal profile was normal. The options for surgical approach included transcranial, endoscopic endonasal, or a combination of both. 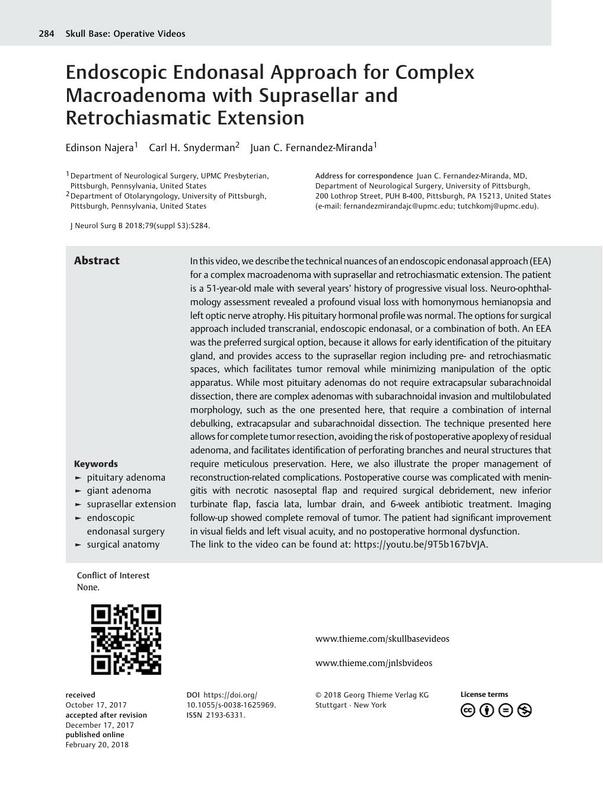 An EEA was the preferred surgical option, because it allows for early identification of the pituitary gland, and provides access to the suprasellar region including pre- and retrochiasmatic spaces, which facilitates tumor removal while minimizing manipulation of the optic apparatus. While most pituitary adenomas do not require extracapsular subarachnoidal dissection, there are complex adenomas with subarachnoidal invasion and multilobulated morphology, such as the one presented here, that require a combination of internal debulking, extracapsular and subarachnoidal dissection. The technique presented here allows for complete tumor resection, avoiding the risk of postoperative apoplexy of residual adenoma, and facilitates identification of perforating branches and neural structures that require meticulous preservation. Here, we also illustrate the proper management of reconstruction-related complications. Postoperative course was complicated with meningitis with necrotic nasoseptal flap and required surgical debridement, new inferior turbinate flap, fascia lata, lumbar drain, and 6-week antibiotic treatment. Imaging follow-up showed complete removal of tumor. The patient had significant improvement in visual fields and left visual acuity, and no postoperative hormonal dysfunction. The link to the video can be found at: https://youtu.be/9T5b167bVJA.